The Cassoulet has to be one of my all time favourite French dishes, and, as Winter approaches, the one that I start to crave the most. Its heartiness makes it the perfect remedy to chilly winds and bleak skies and the fact that it freezes so well means you can make a big batch to then have it ready on hand in smaller portions when a cold day calls for it. The original birthplace of this bean stew is claimed to be the town of Castelnaudary in the south of France, however slight variations are equally famous in the nearby towns of Carcassonne and Toulouse. Regardless of where it originated, it’s agreed that how it came to be, like so many other now-quintessential French dishes, was peasant food, born from the need to make something out of whatever was leftover or cheap. 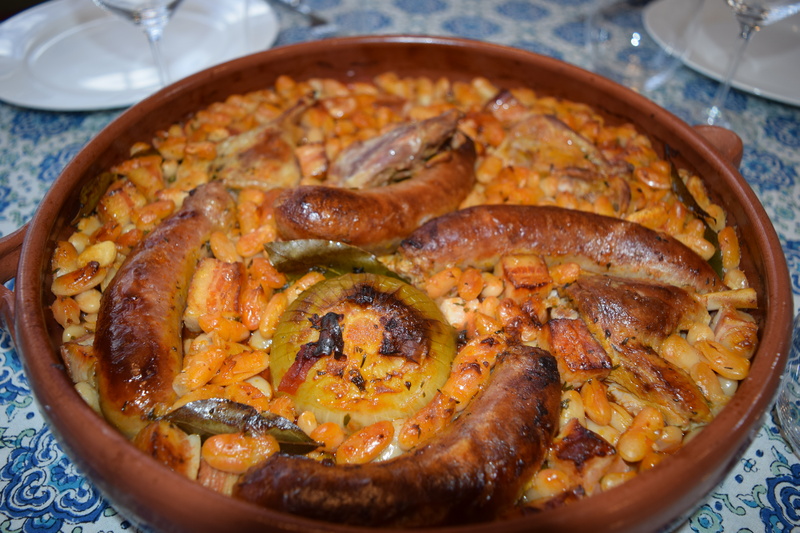 The Castelnaudry Cassoulet, which is the version I am most familiar with, calls for confit duck, Toulouse (pork) sausage, haricot blanc or lingot beans, which are slow cooked and finished off under the grill so that a tantalising crust forms on top, right before serving. Place the beans, chopped thyme, bay leaves, smoked pork belly, sliced garlic, cloves, onions and crushed tomato in a deep cooking pot. Cover with hot water and cook on medium heat until the bean becomes slightly soft. In the mean time, heat up a small frying pan with some olive oil. Season and Quickly seal the pork shoulder and sausages on all sides. Preheat the oven at 180 degrees. Pour the bean mix in a dip baking tray and place the duck legs, pork shoulder and sausages on top. Bake for 2 hours covered with foil and 1 ½ hours uncovered to crisp up the beans.